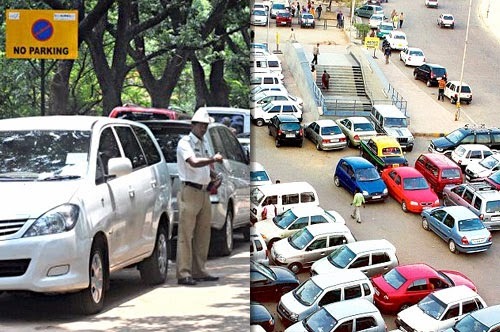 All the cities in India face severe parking problems. Though parking has negligible effect on quality of transport but there is damage to the life of engine due to parking. Due to anonymous increase of traffic in India, parking has become the new problem along with pollution and poor quality roads. There are two types of parking’s, they are off-street parking and the other is on-street parking. Off street parking is common in big shopping malls and theatres and huge offices which are used by employees & customers, on the other hand on-street parking is traffic problem causing as the parking is directly controlled by market forces, with individual parking and hence has high demand and is considered as public property. Some might argue that parking is one of the lesser woes of urban transport, but this view has led to its exclusion from the policy frame work, causing many traffic bottlenecks. This results in poor quality urban transport, misuse of land and increasing social and environmental costs. Now –a – days parking -problem is related to space so we should minimise the space to decrease the parking problems due lack of parking there will be a problem of fuel loss and low air quality or congestion. So in some cities, pay for the usage of parking is also been introduced in busy markets as this the cost of the land is refunded and there will be control of demand and preventing the market from distorted. For its maintenance where the cost is not so high and not free and researches are being done to reduce the area. Fundamentally parking is a problem of space. With the growing culture of automobile dependency in INDIAN cities, the demand for parking spaces are sky rocketed. This is especially because the infra-structural growth of our cities is unable to keep up with the growing demand for spaces to park. The resultant scarcity of parking space has begun to spill over to other aspects of urban life in form of congestion, fuel loss, dispersed land use and low air quality. So as long as there are inexpensive provision for parking, there will be an increase in usage of private vehicles, further abetting the problem. Therefore it is imperative to arrive at a solution that on one hand provides space for parking while simultaneously managing demand for parking on the other. Increasing the parking spaces so that more vehicles can be parked. Improving accessibility and pedestrian paths around parking spaces to make it more convenient to walk from parking space to the destination. This reduces the inconvenience of parking in a space that may not be very close to the desired location. Maximum usage of available space so we can save the la. Parking management, it can be done by more usage of public transportation than private transportation as it entails both cost and monetary. Charge motorists directly for using parking space. This will facilitate immediate recovery of cost and will also act as a tool of demand management. The parking spaces in commercial districts should be priced higher to ensure the space of priority users-customers and clients of the particular stop/building. Time variable pricing will be employed to increase charges, reduce demand and manage parking during peak hours. Progressive prices can be charged to discourage long term parking. Long term counting must not be discounted. Weekly or monthly pricing should be done for long term users, such as employees or residents. The space can be leased out, too. Angular parking is best but parallel parking is used when there is loss of space.